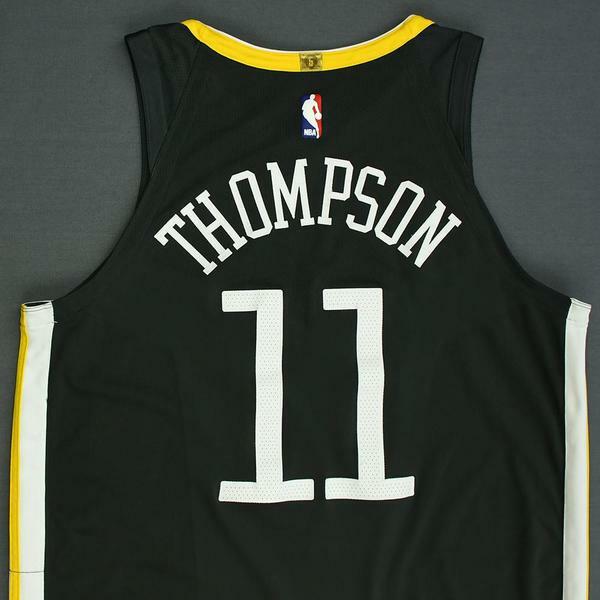 Thompson wore this jersey during three regular-season games. 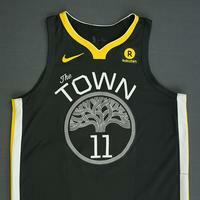 He wore it during the Warriors' 125-111 victory over the New York Knicks on February 26, 2018 at Madison Square Garden in New York, NY, during the Warriors' 109-101 victory over the Washington Wizards on February 28, 2018 at Capital One Arena in Washington DC and during the Warriors' 126-120 loss to the New Orleans Pelicans on April 7, 2018 at ORACLE Arena in Oakland, CA. 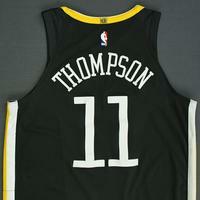 He played 33 minutes and registered a game-high 26 points with 5 assists, 4 rebounds and 1 steal vs. New York, he played 36 minutes and registered 13 points with 3 rebounds and 2 steals vs. Washington and he played 37 minutes and registered 18 points with 1 assist and 4 rebounds vs. New Orleans. 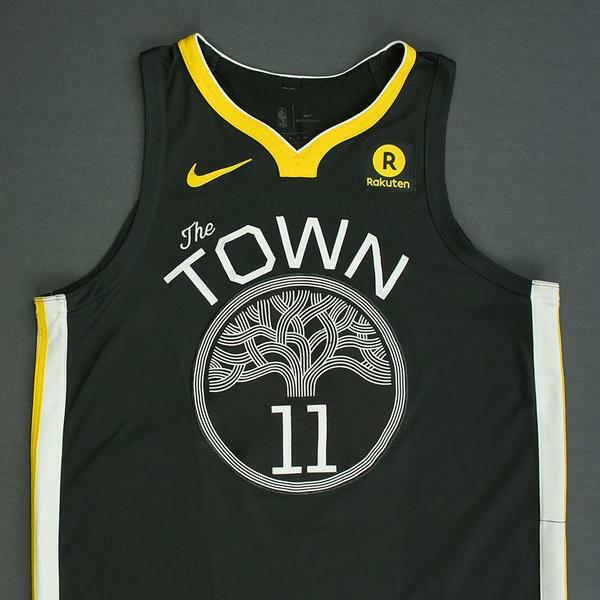 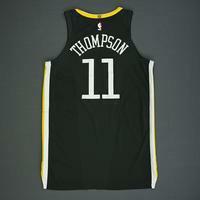 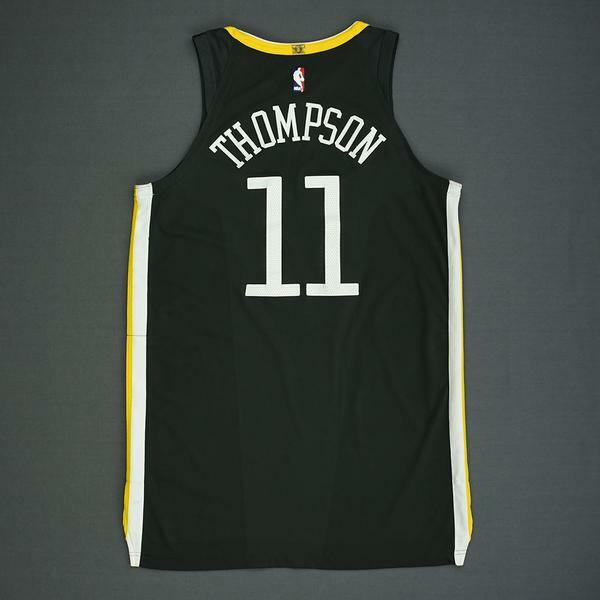 Thompson wore this jersey during four NBA playoff games. 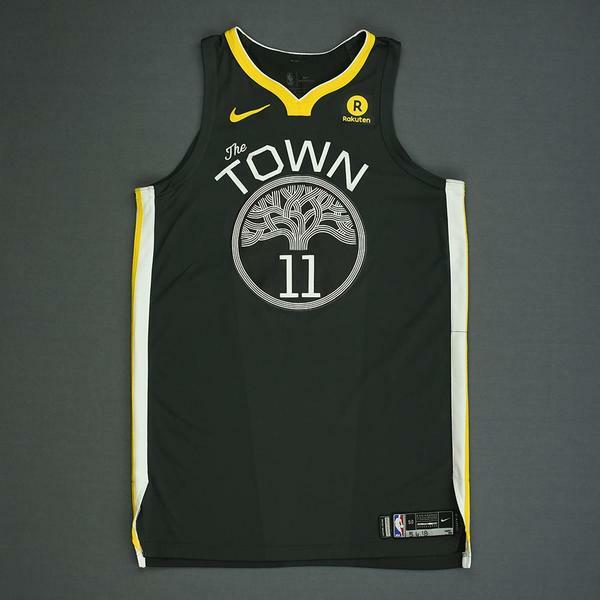 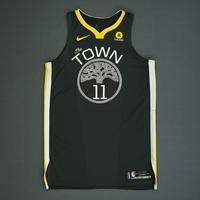 He wore it during the Warriors' 116-101 Western Conference Round 1, Game 2 victory over the San Antonio Spurs on April 16, 2018 at ORACLE Arena, during the Warriors' 121-116 Western Conference Semifinals, Game 2 victory over the New Orleans Pelicans on May 1, 2018 at ORACLE Arena in Oakland, CA, during the Warriors' 119-100 Western Conference Semifinals, Game 3 loss to the New Orleans Pelicans on May 4, 2018 at Smoothie King Center in New Orleans, LA and during the Warriors' 118-92 Western Conference Semifinals, Game 4 victory over the New Orleans Pelicans on May 6, 2018 at Smoothie King Center in New Orleans, LA. 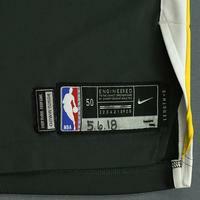 He played 39 minutes and registered 31 points with 5 assists on April 16, he played 37 minutes and registered 10 points with 3 assists and 6 rebounds on May 1, he played 36 minutes and registered a team-high 26 points with 1 assist and 7 rebounds on May 4 and he played 36 minutes and registered 13 points with 7 rebounds on May 6, 2018. 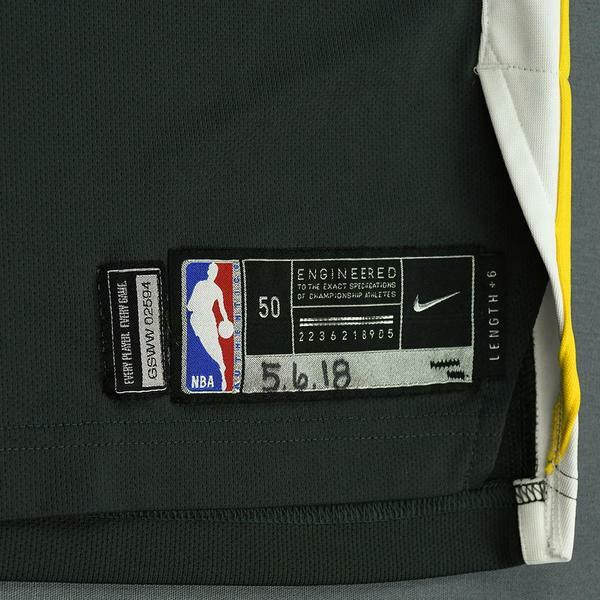 "5.6.18" is handwritten on the jock tag.